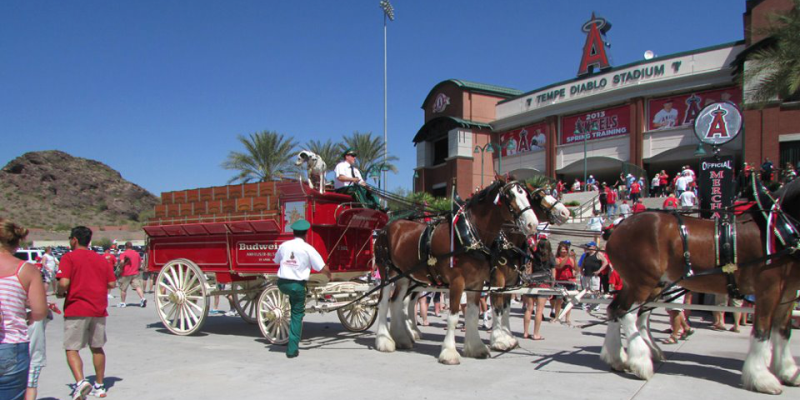 PHOENIX, ARIZONA, FEBRUARY 4th, 2018 – The world-famous Budweiser Clydesdales, the symbol of quality and tradition for Anheuser-Busch since 1933, are scheduled to make several appearances in the area March 7th-18th, 2018, including appearances at Tempe Diablo Stadium (Angels), Sloan Park (Cubs), Camelback Ranch (Dodgers), Peoria Sports Complex (Mariners), Surprise Recreation Campus (Rangers), Salt River Fields (D-backs), and Goodyear Ballpark (Reds) in conjunction with the 2018 Cactus League. The Clydesdales’ appearance in Greater Phoenix is one of hundreds made annually by the traveling hitches. Canadians of Scottish descent brought the first Clydesdales to America in the mid-1800’s. Today, the giant draft horses are used primarily for breeding and show.